The Breadalbane area of Scotland lies in the heart of the country, under the shadow of the Grampion mountains. In the early seventeenth century it was the centre of power for Black Duncan of the Cowl, the feared and powerful chief of the Campbell clan who ruthlessly persecuted and nearly exterminated the MacGreggors, McEwans and McNabs while extending his domain from sea to sea with a string of castles and fortified manors. The extensive Breadalbane estates remained the seat of the Campbells well into the twentieth century. At Breadalbane, in Perthshire, William Murray was born on May 25, 1834. His father was employed by the chief as the head gardener for the estate, a position he would hold for more than thirty-five years. Young William was the oldest son, withdrawn and bookish by nature, so his father used his position to see that he received the most careful and extensive education possible for a young man in the Highlands at that time. For a farm worker's son that meant reading, writing and arithmetic, with literature and philosophy if they became available through itinerant scholars. More advanced educational opportunities were not available. By his late teens, William had come to some definite conclusions about life. Much as he liked the countryside, he was not going to become a slave to it like his father. And, like most Scots, he was enchanted by the writings of Robert Burns, whose poems and lyrics had established themselves in the core of the Scottish psyche. Robert Burns, too, had been the eldest son of a Scot who tilled the soil. While writing his poems he had tried his hand at his father's occupation and failed, then had taken a low-paying government job for the rest of his days. No matter how popular his writings, Burns was never well off. Well aware of his idol's plight, William decided to improve his own chances as a young man and aspiring poet. His father had a brother living in Toronto, Upper Canada. In 1854, at the age of twenty, William Murray emigrated to Canada. He worked in Toronto, probably in his uncle's business, for two years until he had accustomed himself; then he moved to the growing city of Hamilton, which seemed to offer greater opportunities. By 1870 he was secure enough to establish a partnership in the business he knew so well with two other merchants, Alexander Murray (no relation) and William London. They operated a very successful dry goods emporium at a prime downtown location, 12 King Street East between James and Hughson, as Alexander Murray & Co. William became an upstanding member of the community and joined the local Scottish and Gaelic societies. He was a member of the McNab Street Presbyterian Church and a friend to many influential people. Although neither he nor his brother Charles ever married, both sisters did marry well. Phyllis married Rev. Donald Fletcher, the long-serving pastor of the church. His sister Mary was wed to William Hendrie; at her grand house, Holmstead, on Bold Street, she entertained such luminaries as royals who would become George V and Edward VIII, Sir John A. Macdonald, and several governors-general when they visited Hamilton. What sort of man was this poet? William Murray was successful in business, respected in the community, and welcome in the homes of the powerful and influential. He is described as "industrious and earnest" and "very thin and serious," unlike his brother Charlie who was often contrasted as "sleek and fat, usually joking" and who, whenever he undertook employment, never seemed to care if he held on to the job. William was involved in several of the important Scottish societies; in the St. Andrew's Society he was elected to the ceremonial position of "Bard" whose duties were to write a poem for any special occasion. In 1869 he wrote his first poem for St. Andrew's Day; from 1889 on he wrote an address for every St. Andrew's Day celebration. The house in which he lived had extensive grounds and he loved presenting aquaintances with flowers from his gardens. He could often be found puttering in his garden while muttering, working on some poem in his head. He loved dogs; he always had a terrier he named "Archie." Whenever a terrier died, he would obtain another and call it "Archie." He had a historical interest in Clan Murray, in its tartan and its relationship with the Isle of Man, which the Murray clan governed for a time. So, what sort of poet was this man? His first publication in a local paper was in 1863. Greatly influenced by the work of Robert Burns, his early works may seem somewhat derivative because they use the rhythms and constructions so characteristic of Burns. The fame of Scotland's poet. Many early poems dealt with the Scotland he'd left behind: its land, its history and its people much as Burns' had. He often gave his serious subjects a characteristic humourous twist. And capture forever to Britain, Quebec. That gave power to the arm and the spirit of Knox. That gave Watt the control of the magic of steam. That gave to great Gladstone his voice and his votes. At this time he was also attracted to acrostics, poems whose initial letters of each line spell out the name of the subject. He would write and present such poems not only to friends but also to well-known persons: British Prime Ministers Disreali and Gladstone, Sir John A. Macdonald, local artist William Blair Bruce. He wrote a very fawning and flattering one to Bismark, the first chancellor of Germany, and received a polite reply. From the beginning, he became a good friend of the McQueston2 family. He wrote a simple but heartfelt poem for Mary on her wedding to Isaac. And free from care and sorrow. The death of young Muriel Fletcher McQuesten at the age of two resulted in one of his finer poems. Died 27 August 1882, aged 2 years & 10 months. O'er which to brood with heavy heaving heart? One little jewel from a teeming mart?" For aught that moves most mightily the soul. My grief expressless upon Christ to roll?" Upon you sweetly from the upper room. But nature's God will joy and comfort speak. The poem he wrote on the death of Isaac McQueston4 eight years later is very different. To Him whose very name is Love. "O Lord! Thou doest all things well!" About this time he seems to have reached the peak of his writing career. In 1889 he was included in a book called Scottish Poets in America. The author praised his "fine literary taste," and remarked on his "graceful and easy style," and that many poems were "skillfully worked out." He bemoaned the fact that Murray's work was not available in book form and noted that the poet seemed "too unassuming in regards to his own merit." There is some truth in that assertion. He would sometimes read his poems aloud to friends, but never in public. Any poem written for public occasions such as St. Andrew's Day were always read aloud by someone else. Although Murray continued to write and publish in local newspapers and magazines, his contributions were often unsigned or unacknowledged, used to fill the odd empty space. Rather than crafting poetic reflections on the human condition, he seemingly was peoccupied with events and personalities. By reason of his position in the Scottish community, he would be asked to provide poems for occasions such as visits by dignitaries as well as other local events and the annual celebrations of St. Andrew's Day. From time to time he would descend into doggerel, such as this excerpt from a poem written at dinner between courses. Another example of his work during this time comes from his warm response to a collection of poems published by James McIntyre, the "Cheese Poet" from Ingersoll, Ontario, and author of "Ode to the Mammoth Cheese," a poem many acknowledge as the worst Canadian poem ever. With Tennysonian themes to blend. Murray knew a kindred spirit when he met one. Although sometimes still displaying some of his wit and wordplay, his work became dependent on stale rhythms and rhyme and heavy alliteration. He spent much time and effort toward his annual address to the St. Andrew's Society. Here are excerpts from two addresses, the first from 1901 and the second from 1910. They shop a rapid, with a Duke! This is from the Hamilton Herald, November 27, 1901. The following is excerpted from Murray's address to the St. Andrew's Society as published by the Hamilton Times, November 30, 1910. With either fun or choicer cheer. His poems for the McQuesten family, as they are found in the Whitehern archives, show the same tendency toward frivolity and wordplay. In 1910, Calvin McQuesten was sent by the church to work in the west. This poem was written to congratulate him. as Assistant to Rev. 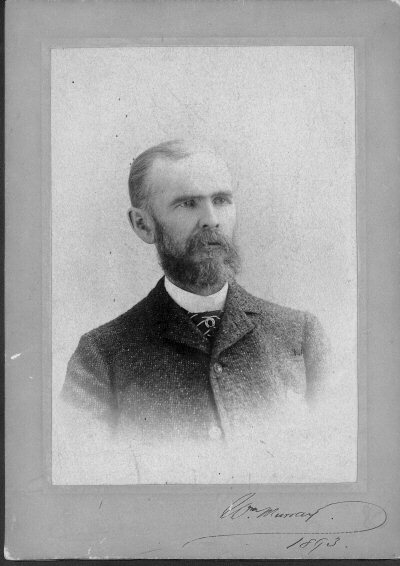 Dr. McQueen, Presbyterian Church Superintendent at Edmonton Alberta." A captain as renowned McQueen." To loved McQuesten and McQueen. A shorter poem survives, written for Reverend McQuesten when he accepted a posting in the province of Quebec in late 1914. The title sounds happy, majestic and high? A stipend to match it you aye can command. Murray wrote this Christmas greeting for the McQuestens in December 1915. To bright "St. Andrew's Minister." Today and soon, a glad new year! So bright, will ne'er be in the lurch. Remember, in 1915 he was eighty-one years old. William Murray enjoyed his standing in the community and was content to contribute to it through his poetry. His friends and family seemingly were more important to him than renown. He never sought it out and never claimed to be more than he was: a local businessman with a knack for language. He found more pleasure in finding that the local newsboys used his rhymes to hawk their papers than in prestigious publication. In comparison with his contemporaries, William Murray was not a poet of national stature and self-effacing as he was, never entertained such a claim. He once described himself as "a witty poetic power and punner." He found a place in life where he could do what he liked for people he liked and was satisfied. William Murray died in 1923. His poetry, whatever still exists, remains uncollected. Jeff Seffinga is the Editor-in-Chief of the Tower Poetry Society. 2 Jeff Seffinga uses "McQueston" and "McQuesten" interchangeably. I admire your resolve to wait upon her a year hence... Stick to your promise, call upon her when another year shall have rolled around, and if she be the woman that from what I have heard and seen I suppose her to be, I shall fully expect a new suit of clothes, wherein properly arrayed, I may witness with savage satisfaction the sacrifice of "Isaac the Happy!" A year later, the engagement was renewed (W-MCP5-6.257) and there is evidence to suggest that the engagement had been broken once more sometime later and again renewed approximately three months before the wedding (W2339). For some of Mary and Isaac's courtship letters, see W2259, W2336, W2337, W2339, W2343, W2344, W2351, W2361, W2364, W2368, W2377, W2380, W2392. 4 Isaac's sudden death appears to be alcohol-related (W2520, W2275) although it is clear that he had suffered from health problems--both physical and emotional--for some time See W2511, W4327 and Mary Anderson's thesis essay "Mary's Childhood, Marriage, Widowhood, Six Children and Lives of Genteel Poverty." 5 The entire poem, as taken from a clipping from The Hamilton Herald, November 27, 1901, can be found at Box 09-208. 6 For the brief but affectionate letter containing this poem, see W8748. 7 Note: This poem was addressed to Mrs. Mary Baker McQuesten, Rev. Calvin McQuesten's mother, not Mary Baldwin McQuesten, Calvin's older sister.